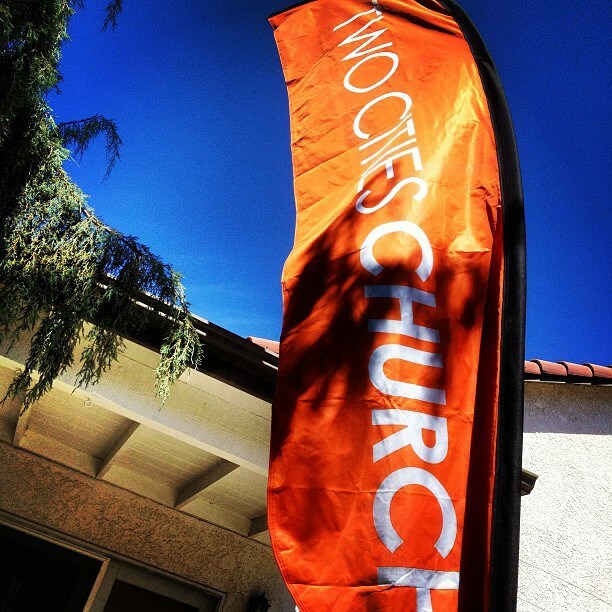 This past Sunday night we, Two Cities Church, had an event called Your Move. We gathered some of our core together and some new people to talk about a few things on the horizon. Things like Guest Services, our 0-5 year-old environment (Waumba Land) and our new timeline. Just as I began the ending prayer a young couple walked in the doors. They were greeted by Jill Douty, one of our team members, and they sat down at their table. After I ended the event and started talking to people in the crowd, I came over and introduced myself. It turns out that they’re looking for a church, they were driving by and they saw our two big feather signs at the street. They saw cars in the parking lot and stopped in. You never know who’s going to show up and you never know what their story is, but we’re creating a church that people off the street might walk in, only catch a couple minutes of what we’re doing and say… “I’d like to check this out further.” This couple connected with Jill and said they’d like to come to the Launch Group that the Douty’s lead at their home on Sundays. Thank you to Thilani for designing the signs. Thank you Chris for printing them through your business (Revision Printing). Thank you Chris for setting them up and tearing them down on Sunday. Thank you Jill for engaging them.